ادهمی, صادق, عطاپور, مسعود, علافچیان, علیرضا. (1394). بررسی اثر زمان غوطه‌وری در محلول کلرید سدیم بر میزان حفاظت از خوردگی پوشش سیلانی اعمال شده بر مس. 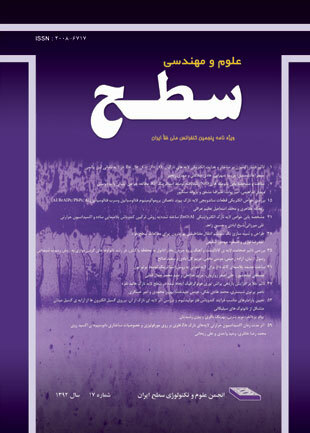 نشریه علوم و مهندسی سطح, 11(26), 11-22. صادق ادهمی; مسعود عطاپور; علیرضا علافچیان. "بررسی اثر زمان غوطه‌وری در محلول کلرید سدیم بر میزان حفاظت از خوردگی پوشش سیلانی اعمال شده بر مس". نشریه علوم و مهندسی سطح, 11, 26, 1394, 11-22. ادهمی, صادق, عطاپور, مسعود, علافچیان, علیرضا. (1394). 'بررسی اثر زمان غوطه‌وری در محلول کلرید سدیم بر میزان حفاظت از خوردگی پوشش سیلانی اعمال شده بر مس', نشریه علوم و مهندسی سطح, 11(26), pp. 11-22. ادهمی, صادق, عطاپور, مسعود, علافچیان, علیرضا. بررسی اثر زمان غوطه‌وری در محلول کلرید سدیم بر میزان حفاظت از خوردگی پوشش سیلانی اعمال شده بر مس. نشریه علوم و مهندسی سطح, 1394; 11(26): 11-22. در این تحقیق به بررسی اثر زمان‌های مختلف غوطه‌وری در محلول کلرید سدیم 5/3 درصد وزنی بر میزان راندمان حفاظت از خوردگی پوشش سیلانی پرداخته شد. این پوشش از دو ترکیب سیلانی تترا اتیل اورتو سیلیکات (TEOS) و تری مرکاپتوپروپیل (تری‎متوکسی‎سیلان) (MPTMS) تشکیل و به روش غوطه‌وری بر زیر لایه مسی اعمال شد. آزمون طیف‌سنج مادون‌قرمز تبدیل فوریه نشان داد که پوشش TEOS+MPTMS، از طریق دنباله گوگردی خود با سطح مس پیوند کووالانسی Cu-S برقرار کرده است. تصاویر میکروسکوپ نیروی اتمی به دست آمده بعد از 120 ساعت غوطه‌وری، تخریب کمی را برای سطح پوشش TEOS+MPTMS نشان داد که مطابق با تصویر به دست آمده از میکروسکوپ نوری بود. رفتار الکتروشیمیایی نمونه‌های مس بدون پوشش و پوشش‌دار با استفاده از آزمون‌های پلاریزاسیون پتانسیو دینامیک و طیف‌سنجی امپدانس الکتروشیمیایی بررسی شد. نتایج نشان داد که بیشترین حفاظت از خوردگی مس توسط پوشش، در ساعات اولیه غوطه‌وری به دست آمد و میزان آن با گذشت زمان کاهش یافت؛ اما حتی بعد از گذشت 168 ساعت، پوشش سیلانی ایجاد شده اثر بازدارندگی خود را حفظ کرده است. 1. C. Powell, P. Webster, C. D. Association, Copper Alloys for Marine Environments, Copper Development Association, (2011). 2. L. Núñez, E. Reguera, F. Corvo, E. González, C. Vazquez, Corrosion of copper in seawater and its aerosols in a tropical island, Corrosion Science, 47(2005)461-484. 3. F. J. Cornwell, G. Wildsmith, P. T. Gilbert, Pitting Corrosion in Copper Tubes in Cold Water Service, British Corrosion Journal, 8(1973)202-209. 4 M. Fonsati, F. Zucchi, G. Trabanelli, Study of corrosion inhibition of copper in 0.1 M NaCl using the EQCM technique, Electrochimica Acta, 44(1998)311-322. 5. O. Hazzazi, Corrosion inhibition studies of copper in highly concentrated NaCl solutions, Journal of Applied Electrochemistry, 37(2007)933-940. 6. S. Zor, Sulfathiazole as potential corrosion inhibitor for copper in 0.1 M NaCl, Prot Met Phys Chem Surf, 50(2014)530-537. 7. X. Zhong, Q. Li, J. Hu, X. Yang, F. Luo, Y.Dai, Effect of cerium concentration on microstructure, morphology and corrosion resistance of cerium–silica hybrid coatings on magnesium alloy AZ91D, Progress in Organic Coatings, 69(2010)52-56. 8. A.-P. Romano, M. Fedel, F. Deflorian, M.-G. Olivier, Silane sol–gel film as pretreatment for improvement of barrier properties and filiform corrosion resistance of 6016 aluminium alloy covered by cataphoretic coating, Progress in Organic Coatings, 72(2011)695-702. 9. J.-h. Liu, Z.-w. Zhan, M. Yu, S.-m. Li, Adsorption behavior of glycidoxypropyl-trimethoxy-silane on titanium alloy Ti–6.5Al–1Mo–1V–2Zr, Applied Surface Science, 264(2013)507-515. 10. C. Sanchez, B. Julian, P. Belleville, M. Popall, Applications of hybrid organic-inorganic nanocomposites, Journal of Materials Chemistry, 15(2005)3559-3592. 11. F. Zucchi, V. Grassi, A. Frignani, G. Trabanelli, Inhibition of copper corrosion by silane coatings, Corrosion Science, 46(2004)2853-2865. 12. T. Tüken, N. Kıcır, N. T. Elalan, G. Sığırcık, M. Erbil, Self assembled film based on hexane-1,6-diamine and 2-mercapto-ethanol on copper, Applied Surface Science, 258(2012)6793-6799. 13. G. Rajkumar, M. G. Sethuraman, Corrosion protection ability of self-assembled monolayer of 3-amino-5-mercapto-1,2,4-triazole on copper electrode, Thin Solid Films, 562(2014)32-36. 14. A. L. K. Tan, A. M. Soutar, Hybrid sol-gel coatings for corrosion protection of copper, Thin Solid Films, 516(2008)5706-5709. 15. R. Tremont, H. De Jesús-Cardona, J. García-Orozco, R. J. Castro, C. R. Cabrera, 3-Mercaptopropyltrimethoxysilane as a Cu corrosion inhibitor in KCl solution, Journal of Applied Electrochemistry, 30(2000)737-743. 16. M.-A. Chen, X.-B. Lu, Z.-H. Guo, R. Huang, Influence of hydrolysis time on the structure and corrosion protective performance of (3-mercaptopropyl)triethoxysilane film on copper, Corrosion Science, 53(2011)2793-2802. 17. S. Pellice, P. Galliano, Y. Castro, A. Durán, Hybrid Sol-Gel Coatings Produced from TEOS and γ-MPS, J Sol-Gel Sci Technol, 28(2003)81-86. 18. J.-K. Hong, H.-R. Kim, H.-H. Park, The effect of sol viscosity on the sol–gel derived low density SiO2 xerogel film for intermetal dielectric application, Thin Solid Films, 332(1998)449-454. 19. I. R. Hill, I. W. Levin, Vibrational spectra and carbon–hydrogen stretching mode assignments for a series of n‐alkyl carboxylic acids, The Journal of Chemical Physics, 70(1979)842-851. 20. H. Fan, S. Li, Z. Zhao, H. Wang, Z. Shi, L. Zhang, Inhibition of brass corrosion in sodium chloride solutions by self-assembled silane films, Corrosion Science, 53(2011)4273-4281. 21. E.-S. M. Sherif, Effects of 2-amino-5-(ethylthio)-1,3,4-thiadiazole on copper corrosion as a corrosion inhibitor in 3% NaCl solutions, Applied Surface Science, 252(2006)8615-8623. 22. H. Y. Ma, C. Yang, B. S. Yin, G. Y. Li, S. H. Chen, J. L. Luo, Electrochemical characterization of copper surface modified by n-alkanethiols in chloride-containing solutions, Applied Surface Science, 218(2003)144-154. 23. G. Kear, B. D. Barker, F. C. Walsh, Electrochemical corrosion of unalloyed copper in chloride media––a critical review, Corrosion Science, 46(2004)109-135. 24. M. E. Orazem, B. Tribollet, Electrochemical Impedance Spectroscopy, Wiley, (2008). 25. J. Bisquert, G. Garcia-Belmonte, P. Bueno, E. Longo, L. O. S. Bulhões, Impedance of constant phase element (CPE)-blocked diffusion in film electrodes, Journal of Electroanalytical Chemistry, 452(1998)229-234. 26. F. B. Growcock, R. J. Jasinski, Time‐Resolved Impedance Spectroscopy of Mild Steel in Concentrated Hydrochloric Acid, Journal of The Electrochemical Society, 136(1989)2310-2314.